This is a discussion forum for fans of the Brain Science Podcast. The Brain Science Podcast is "for everyone who has a brain;" which hopefully includes YOU. Its goal is to explore how recent discoveries in neuroscience are unraveling the mysteries of how our brains make us who we are. The focus is on the books that have been featured on the Brain Science Podcast, but it is also a great place to share other books about the brain and neuroscience. [close] This forum is open to people of all ages so please no profanity, obscene language, etc. All posts are the sole responsibility of the person posting them. No medical advice will be offered. Dr. Goldberg is interviewed in Episode 143. [close] Dr. Goldberg is interviewed in Episode 143. BS 146 Alan Jasanoff on "the Biological Mind"
A book on science and comeback. Can the Arts inform Neuroscience? 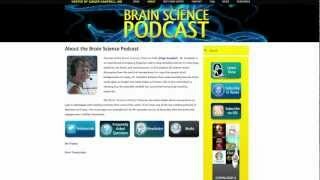 * BSP 112 What do Mirror Neurons Really DO? * BSP 109: Avoiding "Neuromania"
* BSP 96: Robert Burton's "Skeptic's Guide to the Mind"
Putting Neuroscience Back Into Freud?